A new “virtual factory” being developed by Swansea University, Tata Steel and WMG will fast-track innovation in the steel sector and help new products reach market far more quickly it has been claimed. 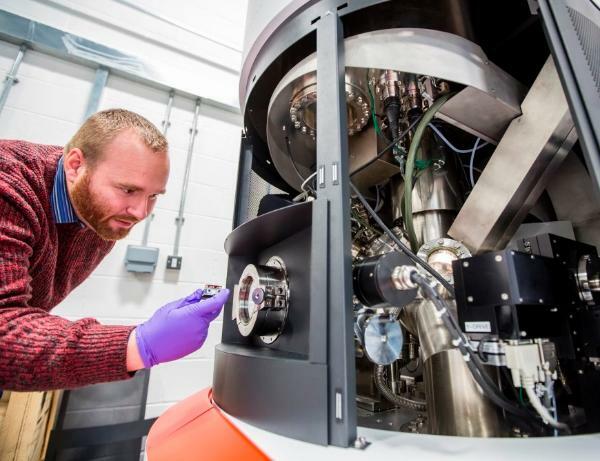 Chemical analysis of steel – Dr James McGettrick of Swansea University, with an X-ray Photoelectron Spectrometer. The £7m initiative, funded through the EPSRC’s Prosperity Partnership initiative, will be based on a process called Rapid Alloy Prototyping which enables much of this testing to be carried out in research labs and imaging suites rather than in an actual steel plant. Innovation in the steel industry is crucial to keep pace with changing technologies and customer requirements, but developing new steel alloys is often a very slow process with lots of steps and requiring expensive trials on hundreds of tonnes of material, much of which has to be remade into new steel products. Test data can be fed into computational models, further refining their accuracy and allowing for better predictions on the final material properties. Alloys which show promise can then be investigated at a larger scale and in more detail. According to the statement from Swansea University, the approach could have an enormous impact on the UK steel sector, enabling hundreds of samples to be tested in the time it currently takes to test one and bringer news and improved steel products to market far more quickly than is currently possible.